Update #3: The new frame is 4mm bitbeam plate printed in PLA-plus, which is great because it's metric now. And I have an arduino, motor-shield, and usb battery installed - had to dial-in more power to the motors. Experimentally, 5-volt at 1-amp was only enough juice to run one (type-130) motor. I tested a fancy E-Flite 7.4-volt LiPo battery (and charger) in this video. The smaller EC2 power connectors are also nice. With the controller set to random movement, heat-sink temp peaked at 140, which is good since the whole thing melts at 205. Looks like the 114:1 gear ratio is still too fast. Update #2: I've added a lightweight and inexpensive Tamiya Double Gearbox under the controller - setup for a 114:1 gear-ratio. 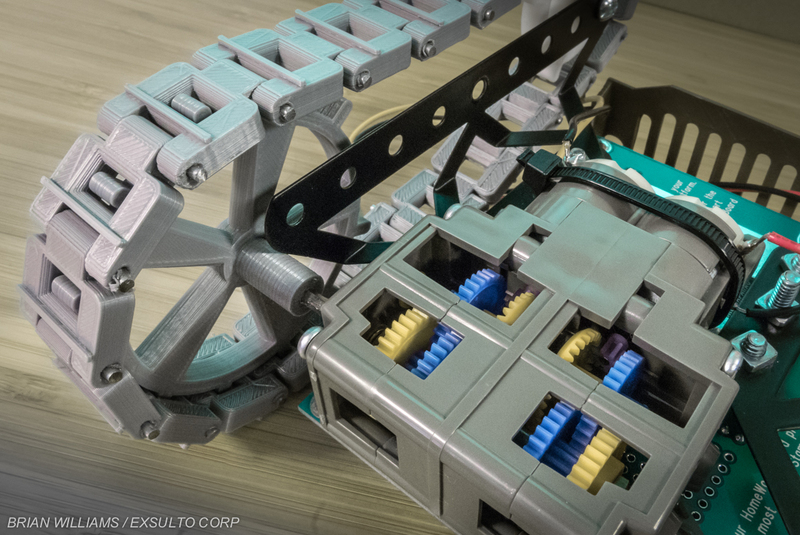 The Tamiya axle was a quarter-inch too short, so I printed a new sprocket-wheel with axle extension. I'm using a simple friction-fit to the hex-bar rear axle. 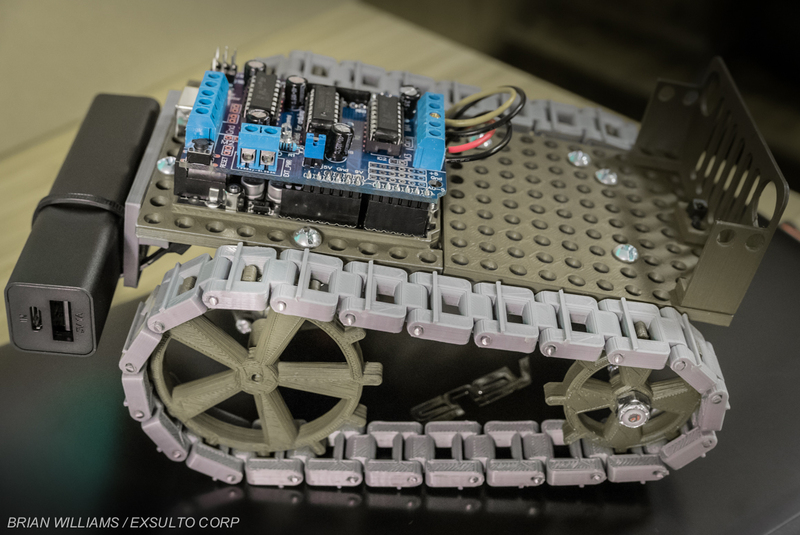 Here I test-fitted these 3d-printed tank-treads, and a (temporary) Parallax controller. 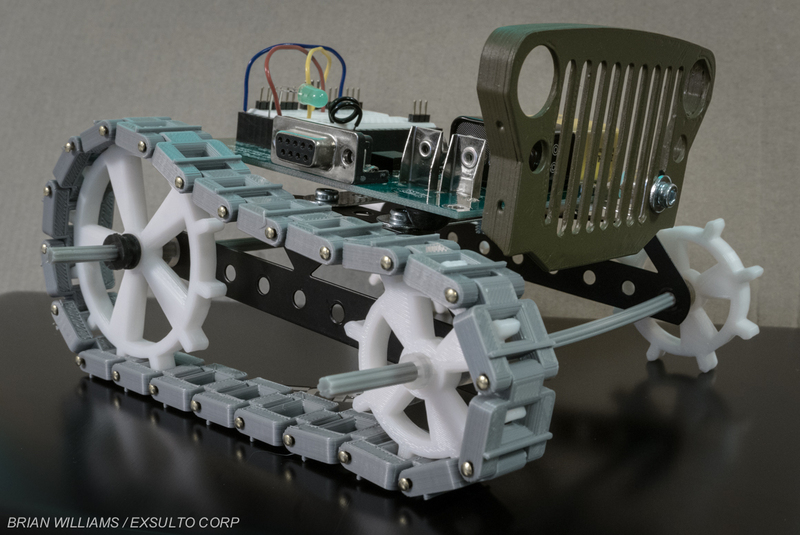 This project was inspired by the "RC MB Jeep in 1:10" and "Simple Arduino Tank" out on Thingiverse. I've often daydreamed building a full-size jeep out in the garage - so I hope this build can scratch that itch. Near-term, I'd like simple radio-control and a first-person-view (FPV) camera. Long-term, I'll swap-in a Arduino controller with Android, RobotOS, vision, self-navigation - the whole enchilada. Maybe the track mechanism needs a spring to keep tension between the axles -- less binding and lower chance of throwing a track. I've thought about spring-tension, but I'd need to find a light design. Maybe an idler wheel. It runs best with very little tension.